Have you ever been to our office? If you haven’t, you might be a little surprised at our location. Most people smile with wonder as they first walk in the door and take a look around—we don’t have a typical strip-mall kind of office… we’re located in an old train station! First, a little background: for the first few years after Andy Stauffer started the company, we worked out of a very small one-room office on Black Forest road which was great… until we started growing, at which point we decided to make the move to the downtown Colorado Springs area. We decided to share space with our friends at Rocky Mountain Metalcraft, in the back of their showroom which was in the former Chrissey Fowler Lumber building, (which, incidentally, is where Andy used to get his lumber for building when he first moved here in the late 1990s). We stayed there for a few years until 2009, when we decided it was time to move again. We wanted to stay downtown, and really liked the general location of where we were, so we started looking for new office space in the most primitive way possible: we walked around our building and looked for “For Lease” signs to see what was available. Just two blocks north of us, we found the the Old Depot square, (which at the time, housed Giuseppi’s Restaurant), and saw that Pella Windows had recently moved out of their office space in the building complex. We called the number on the sign, signed a lease, and the rest is history! “The Old Depot Square” still in action. Photo circa 1915. Here we’ve been, for the past five years, happily housed in the Old Depot square, behind the Antlers Hilton Hotel and right under the bridge at Colorado Ave. It’s a great space for us: we have free parking (which is highly unusual for a downtown location), plenty of room (1,500 feet), and we’re located one block away from the epicenter of downtown Colorado Springs (Pikes Peak & Cascade). 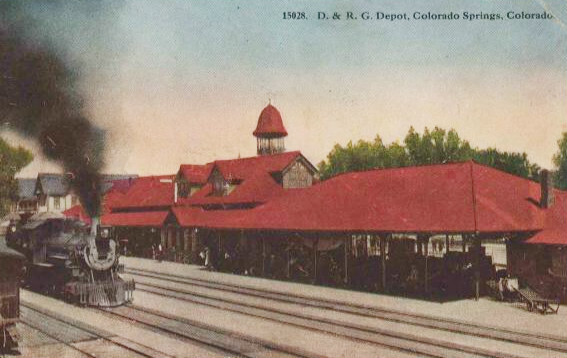 The building we share has quite a history: built in 1871, it was a train station for the Denver & Rio Grande Railroad, and brought many visitors to Colorado Springs from places like Utah and New Mexico (including President Harry Truman, who stopped here in 1948 for a whistle-stop tour during his election campaign!). On its 100th Anniversary, the railroad ended passenger service and the building was turned into a shopping center. An additional south building was added adjacent to the station house and has the same look and feel but offered more room for new tenants (like us!). When we first moved into our suite, we removed the carpet, built several walls, added a few doors, painted, finished the concrete floor, laid some carpet, and much, much more, to improve the space. We wanted to make it feel comfortable, and show off some of the finishes we use in the custom homes we build. With the contribution of about ten of our best trades and vendors, we moved in just before Christmas 2009. Take a look at the photo gallery below to see what it looks like today. If you like what you see, come visit us sometime! Although we can’t always guarantee a quiet conversation, since we still have trains blazing past behind the building every day… but it’s always fun! Stauffer & Sons Construction is a custom home builder in Colorado Springs. Contact us here.